Seems as though I haven't posted in a while and I must confess that is due to being in a funk and not wanting to spread that energy around. I've had a lot of pain that started Saturday when I fried the last of the zucchini and a bit of eggplant. Stood at the stove too long. Pain leads to anxiety and a general state of weirdness so no writing. Starting to feel better so giving it a shot today. Tuesday night a powerful thunderstorm came calling and left some lovely rain and some devastation. 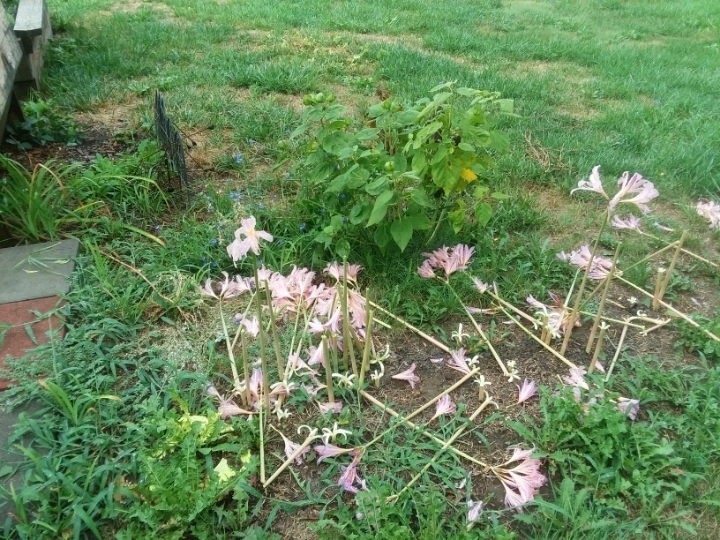 The Resurrection Lilies had just sprung up and the hail from the storm literally whacked them off. I haven't even begun to clean up the mess out there, don't have the heart nor energy. Did pick tomatoes this morning and that was a challenge, the wind having knocked the vines loose from their moorings and are all in a heap. But, at least they are red and you can see them. Harvested a gallon of kale and could have cut the collards and chard, but wasn't feeling it. Avoided the okra row totally as it is up against the electric fence and very muddy still. The husband had cataract surgery on his second eye yesterday and is doing well, but unable to help with the garden. At times like this I totally realize his value. Next, I thought I'd walk down the road because I've been down for about a week with hip pain and getting very little exercise. I didn't get far, got too hot and the gravel was treacherous. So came back home and rode the stationary bike for 10 minutes. Today is my second grandson, Dylan's, 26th birthday. He lives in Austin, TX with a girl I haven't met. He is another one that, like Anah, I helped raised and he spent much of his younger years here with us. On Thursday last I sent him a hefty money order with donations from myself and other family members plus a check from his mother. Am totally freaking out that he has not yet received it. At least it has not been cashed. Communication is sparse between us so he may have it by now and not told me or who knows? Hoping to hear today that it has arrived so I won't be concerned by that situation. 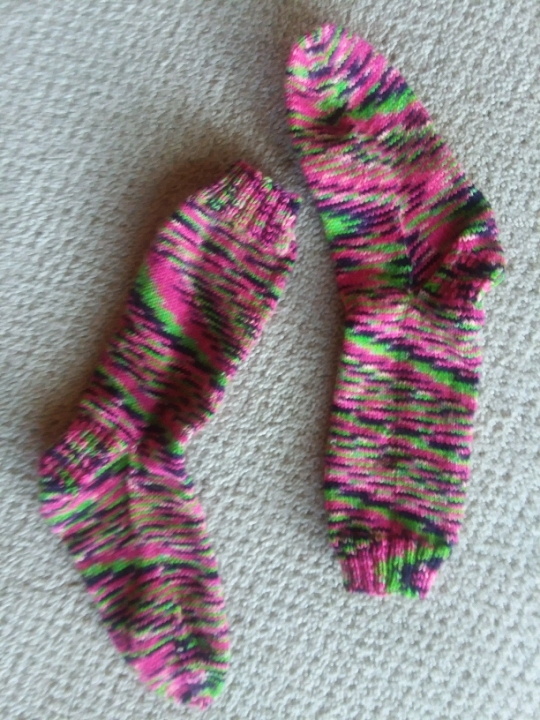 I have completed the so called "ugly socks" and cast on another pair. So, heads up amethyst_witch as these are your socks and once I have an address will send them your way. Saturday night there will be reggae, bluegrass, tacos and tequila at an outside venue that is close. Seriously hopeful to feel like going. Daughters two and four are going and have invited me. Made moussaka and it was delicious, though my stomach was not totally in agreement with it. The husband said, "I"ll never eat that again." So, what shall I do with it? Confounded. Reading the latest in Peter Robinson's "DCI Banks" series which is easy. Right now I am pleased with easy. So it's back to the new socks, maybe some "Broadchurch" on Netflix. All chores are done. I even made my bed. 1. I am the same way when I'm down (I don't want to spread it around) and I'm sorry you've been feeling that lately. I have noticed, and have been thinking of you lots <3 So I'm really happy to hear you're starting to feel better...anxiety is a terrible monster. Absolutely ok, I often cannot organize my thoughts. Husband doing well and I seem to be coming round a bit. Hah on Anah and gardening or any other kind of work, she only wants to run around with her friends, but I'm glad she has lots. Will get socks in mail soon, you are going to make them look great ! Oh and Dylan got his $$$, talked to him yesterday. So glad you are both starting to feel better :) xo. lovely picture of you and Dylan. i hope you hear from him soon. He's a sweetheart, but a bit of an airhead when it comes to RL stuff. I might get on the tomato pie wagon. What’s the recipe? I am glad you are feeling better and able to update. Love the picts, as always! Thanks, I get weary of feeling bad. I hope you continue to feel better. It is so frustrating to see how illness leads to less exercise, which exacerbates whatever is wrong. Hopefully the time in the garden and on the treadmill will help get you back to your usual self. I miss your posts. I can’t believe you have a 26 year-old grandson! He looks like a fine young man. Love the socks - I swear, when the weather cools, I am getting together with amethyst_witch so I can admire them in person. Thanks for the well wishes, I'm ready to feel good again. He is a great kid, but not the oldest grandchild. She just turned 33. Would be cool to see you and hrr and the socks all together!! Gee, quite a lot had happened since you posted last! So, you, too have hip problems. Do you sometimes feel worse with rain? I do. Love your colourful socks. I'm also jealous of your pants! 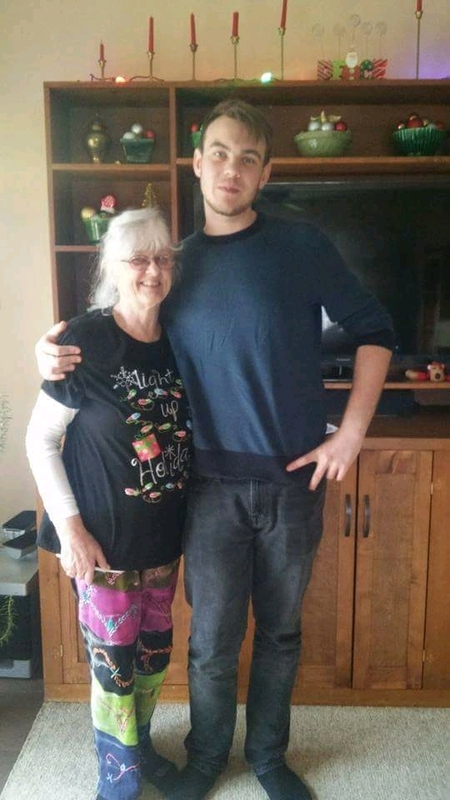 So, your lovely grandson has grown up and is now way taller than 'grandma'. Lovely photos. And what? Your husband doesn't like mousaka? Or is it just that it didn't agree with his tummy? Oh yes the weather affects me too.. I love those pants, have had them a long time, good to know someone else likes them. I think thr husband was worried about his stomach though it didn't cause him problems. Men....meh! Sometimes the weather effects me, sometimes it doesn't. So weird! I tried to buy some of those pants when they were in the shop, but they had none in my size! And, there's no accounting for hubbies! I made your tomato pie this morning, though I didn’t manage to take a photo. If I remember I’ll snap one of a piece when I eat the leftovers. Delicious! The hubby said it’s a keeper too. I hope you are feeling better all around and that your hubby’s healing from his surgery. Husband doing great, already experiencing visual improvement.